Everyone knows that the stock market hates uncertainty, and right now DC is giving investors plenty of uncertainty to fret over. That includes the ongoing trade war, risks of the 4th government shutdown in 13 months, the Mueller investigation report coming in February or March, and a debt ceiling showdown in mid to late 2019. Normally investors do well by ignoring such political noise, but with these political risks now weighing on actual economic and corporate profit fundamentals, it’s important to stay abreast of what the DC circus is doing. Unfortunately, the most recent news on the trade war and government shutdown front isn’t good. Here’s what you need to know about how important events are unfolding and what it likely means for your portfolio in the coming weeks and months. One of the main reasons we saw the S&P 500 (SPY), Dow Jones Industrial Average (DIA) and Nasdaq (QQQ) saw the best January rally in 32 years was because of optimism about a coming trade deal between the US and China. That included China offering to buy an addition $1+ trillion in US exports over the next six years (eliminating the trade deficit and potentially boosting US economic growth by 2.3% in 2024). Meanwhile, President Trump kept up a steady stream of positive tweets and told reporters that talks were going “very well” and the US and China were making “excellent progress” on reaching a deal before the March 1st deadline. In fact, Trump went on to say that he might meet with China’s President XI in February to finalize a deal, which insiders told news outlets like Bloomberg, CNBC and the Wall Street Journal could include the US reducing/eliminating Chinese tariffs in exchange for China immediately buying more US goods and talks on IP protection and non-tariff barriers continuing. Well, unfortunately, it now appears that Trump won’t be meeting with XI after all, at least not in February, which likely means no trade deal inspired rally is possible this month. But that doesn’t mean that stocks are likely to tank because CNBC is now reporting that administration sources are telling it that the March 1st deadline (when tariffs were supposed to jump from 10% to 25% on $200 billion worth of Chinese imports) might be extended. In essence, this means that the earlier base case scenario many analysts expected (tariffs remain the same and we extend the deadline) still appears to be in effect. While that’s far from what bullish investors had hoped for (we’re not likely to see much of a rally from maintaining the status quo) at least even more damaging tariffs won’t be added to the ones currently in place. And we can’t forget that both Trump and China have big incentives to strike a deal relatively soon (Trump and Xi are apparently now planning to meet in March). From Trump’s perspective, he needs a big win (“the greatest trade deal in history”) to run on in 2020. China’s autocratic government (Xi is effectively president for life) may not have political motives to cut a deal soon, but it certainly has strong economic ones. China’s consumer spending over the lunar new year (China’s version of Christmas) grew at its weakest rate since 2005. Meanwhile, its manufacturing sector is in a recession, manufacturing profits are now falling (and at an accelerating rate each month), and its government just reported that economic growth in 2018 was the slowest in 28 years. 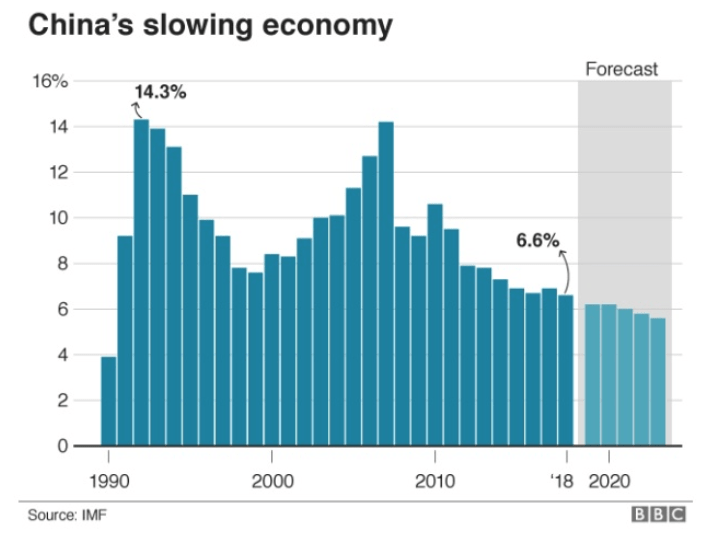 And with the IMF forecasting that China’s growth will keep slowing for the foreseeable future, Beijing doesn’t just want a deal soon, they absolutely need one. Thus a preliminary deal (that Wall Street will almost certainly cheer with rising prices) is still likely in March of April. But sadly, the latest news on the shutdown front doesn’t have nearly as good of a silver lining. This weekend various news outlets such as the New York Times were reporting that a compromise deal that saw some wall funding traded for another shutdown being avoided was looking increasingly likely. Lawmakers in both houses and from both parties were racing to finalize a bill that must be complete by the end of Monday to meet the Friday deadline. That’s because current House rules require any budget bill to be officially introduced three days before it can be voted on. Thus a final draft needs to be complete on Monday, February 11th, so that congresspeople and Senators can review it and make any necessary amendments. Then the Senate could vote on it on Wednesday or Thursday, and the House the next day, sending the bill to Trump’s desk for signing right before the Friday midnight deadline expires and the 4th shutdown in 13 months begins. Sadly on Sunday afternoon, it appears talks broke down, though not over wall money. Democrats have backed off their “zero for the wall” stance ($1.3 to $2 billion has been floated as a compromise) and Trump recently said he’d accept less than $5.7 billion. Rather other points of contention, in this case, the number of detention beds to house illegal immigrants set for deportation, seems to be the main sticking point. Democrats are hung up on the number being capped at 16,500, the same number as existed during the end the Obama’s term in office. Republicans are insisting the number be higher, in the name of being able to deport more dangerous criminals. According to Senate Appropriations Chairman Richard Shelby (R-AL), the odds of a compromise are now 50/50. The new goal appears to not be a permanent deal but a stop-gap measure that extends funding for the affected agencies and departments for a few more weeks and basically kicks the can down the road a bit more. So does that mean that the longest and most damaging shutdown in history is coming back for part two (which might be even longer)? Fortunately, the odds of that are pretty small. The Trump administration has already drafted the emergency declaration it says would authorize it to divert over $7 billion to immediately begin building the border wall, even without Congressional funding. Mind you, Congress has the ability to overrule such a declaration with its own bill, and it would take just four GOP defections in the Senate to pass such a law. But Trump has the ability to veto that bill and thus only a veto-proof 67 Senatorial votes (unlikely) could torpedo that option for the President, whose base considers the wall to be one of, if not the most important, campaign promises he made in 2016. So what does all this mean for the economy, the stock market and your portfolio? Economically speaking both another shutdown (which appears to be a 25% to 33% probability event) and a breakdown in trade talks would be very bad. The New York Fed’s real-time GDP growth model is pointing to very weak growth in both Q4 2018 and Q1 2019 (due to the shutdown the first estimate of Q4 growth is now scheduled for February 25th and another shutdown would delay it indefinitely). Now it’s important to remember that this real-time economic model isn’t perfect and other analysts differ on Q1 growth estimates. ISM just reported that based on its most recent service index survey (new orders for services, that makeup 80% of the US economy), they believe we’re growing at 2.8% right now. But given that the Congressional Budget Office estimates the 35-day shutdown knocked 0.1% off Q4 growth and 0.2% off Q1’s figure, a second prolonged shutdown might very well slow growth below 2% and if it drags on long enough even cause a full-blown recession (according to JPMorgan’s CEO Jamie Dimon) in 2019. Fortunately, Tenessee GOP Congressman Chuck Fleischmann (who sits on the 17 member conference committee working on the shutdown bill) says the odds of another shutdown are “next to nil”, if only because few legislators have the stomach for another one. Given such reporting, I’m inclined to believe that Trump will extend the deadline, current tariffs will remain in effect, and negotiations will continue into March until he and Xi meet that month. So what does that mean for the stock market? Well, the good news is that according to FactSet Research the forward PE for the S&P 500 is now 15.8, basically equal to the 20-year average of 16.0. So with stocks historically at fair value, and with the trade war and government shutdown not likely to impart additional damage, chances now appear good that stocks will trade roughly flat and based on real-time fundamentals. But the bad news is that the thing investors are watching most closely, 2019’s EPS growth estimates, have been falling at their fastest rate in three years. 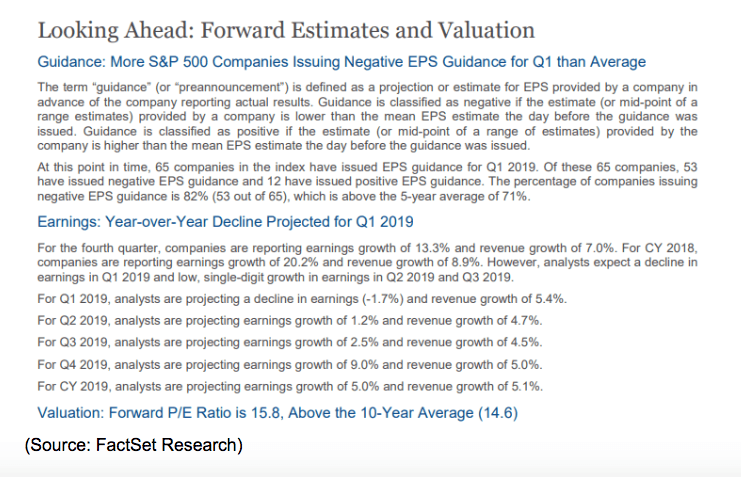 As recently as October analysts were expected 10.5% EPS growth for the S&P 500 in 2019, and today that estimate is down over 5% and sits at 5%. The big reason for that is because higher input costs (partially from tariffs) and falling sales from China are hurting both the top and bottom line of numerous multi-national firms. The longer the trade deal takes to eliminate tariffs (which was baked into earlier growth forecasts) the lower 2019 EPS growth expectations are likely to fall. In Q1 analysts now expect the first negative earnings growth quarter in three years, with tech firms leading the decline. If the status quo remains in effect on tariffs all year, then 2019 might see an earnings recession (not the same as an economic recession) which would mean stocks might drift lower along with falling earnings projections. But that’s not to say that we’d see a December style crash, just gradually declining prices, which would be appropriate due to deteriorating fundamentals. Fortunately, I’m still confident that a trade deal of some kind will occur in March of April, which should mean that stocks are actually likely to trade flat for a few weeks or months (until the trade deal is official) and avoid 2019 becoming the second negative year for stocks in a row (and only the second down year since 2008). The good news is that while the latest trade war/shutdown news isn’t good, it’s also not disastrous. While it now appears unlikely that even a preliminary trade deal can be struck in February (which would be a big boost to stocks) it also appears as if current tariffs will remain in place beyond the March 1st deadline. While that will continue to take its tolls on the U.S. and Chinese economies (and corporate profits) at least the bad situation won’t get worse. What’s more, we’ll probably get a preliminary deal (in which China buys more US imports in exchange for a reduction/elimination of tariffs) in March or April, while DC and Beijing continue to negotiate over other important issues like patent protection, non-tariff barriers, and China’s 2025 growth initiative. Meanwhile, it now appears less likely that a deal can be reached over the border wall, raising the risks of yet another shutdown. However, here too there is some good news. While a potential compromise now looks to be a 50/50 proposition, chances are good that Trump will declare a state of emergency to appease his base and start building the wall (in theory at least). In reality that would mean a years-long fight in the courts and little to any wall would actually get built. But as long as the border wall/shutdown fight ends up shifted to the courts, where it can’t do actual economic damage, such a scenario shouldn’t negatively affect stocks. Ultimately the trade war is the more important risk facing the economy right now, and the longer it drags on the slower US growth is likely to be in 2019. That’s not great for earnings, which is why EPS growth forecasts keep falling. But with the market now trading at historically fair value (on a forward PE basis) as long as things don’t get much worse, stocks are likely to trade flat for the next few weeks or months, until a preliminary trade deal is finalized. While that might disappoint investors who were hoping for January’s epic rally (the best January performance in 32 years) to continue, at least the risks of a retesting of December’s frightening lows now appears to be diminishing.